There is no shortage of books and blog posts on goal setting. 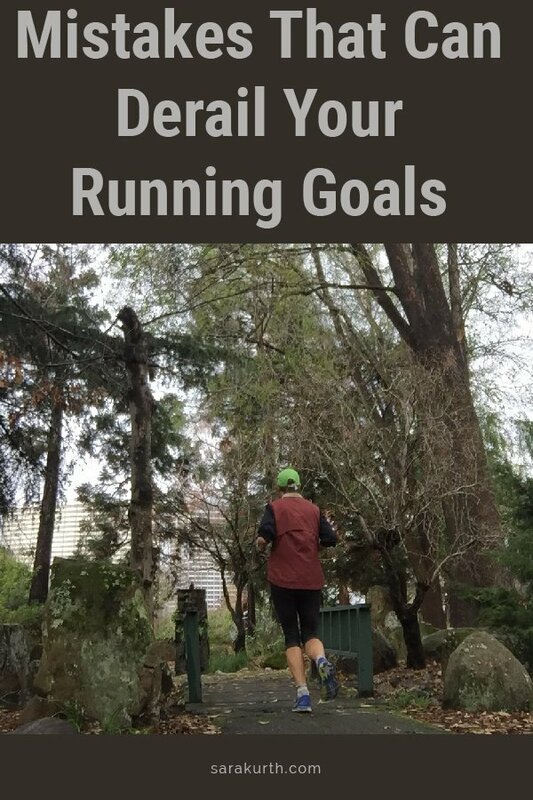 On this blog alone I’ve written any number of times about goal setting for runners – about setting your goal, making sure your goals are realistic, tweaking bad running goals to make them better. In many cases, in both running and in life, setting the goal is the easy part. For type-A planners like me, creating timelines and action plans can be fun (though I know I may be in the minority there). But setting a goal and making a plan isn’t enough to accomplish anything. Eventually, you are going to have to take action. And once you take action, the messy facts of reality can pop up. You will have to run on days you don’t want to. You’ll have to do one more lap of the track when you really just want to quit. Your sweatpants, the couch, and Netflix can look really tempting after a long day of work as an alternative to your planned run. When reality meets your running goal action plan, there are a few common mistakes that can hijack your goal. But simply being aware of these trouble spots can go a long way to making sure you don’t fall victim to them. You can do everything the same way and one run will be amazing, the next will the terrible. That’s just how running is. Bad runs can make you question everything. Am I training properly? Can I really complete a marathon? Why did I ever think I could run a 5K in under 30 minutes? All the optimism you had when you set your running goal can easily be forgotten or overlooked. Learn what you can from a bad run (was your fueling sub par? did work stress leave you feeling off? ), but don’t let it discourage you from pushing forward with your goal. If you set a goal, you also need to have some idea of how you’ll accomplish that goal. While I encourage you to create a fairly detailed action plan, I know that isn’t everyone’s style. Even if you aren’t going to create an in-depth plan, you need to create some plan. You need some idea of how you are going to get from where you are to where you want to be. Sketch out at least a basic plan of the things you need to do to accomplish your goal. After you’ve created a plan, you need to follow it. This can often be a struggle for runners, especially when it comes to rest days. Rest days are an important part of training (not slacking off from training). But many runners will still want to run on rest days – making up for days they didn’t run, or banking runs for days they might miss in the future. But your plan in place for a reason – follow it. Doing more is just asking for burnout or injury. Having a goal and making a plan aren’t enough. You need to actually do the work. I think of this every time I see people at the gym, sitting on an exercise bike, checking email on their phones. I then hear them complain about how they aren’t seeing results from their ‘workouts.’ Sitting on the bike isn’t enough – at some point, you need to actually pedal the bike. Or for runners – you need to put on your shoes and head out the door. It’s important to know why you want to accomplish your goal. Your goal needs to be truly important to you, otherwise, you likely won’t be willing to put in the hard work or make the sacrifices you’ll need to make to accomplish it. When you know your why, test it against what I call the cold, rainy Saturday test – imagine you are in bed early on a Saturday morning. It is dark, cold, and rainy and you have a 10-mile (or whatever distance is considerable to you) run to do. Is your goal, and your why, important enough to you to get out of bed to do that run? For me, this often comes into play when I set goal times for races. I set goal times because I feel like I should, but ultimately, I’m just not motivated by my finish times or setting PRs. The idea of taking 10 minutes off my finish time will not motivate me to get out of bed on a Saturday morning. I know I won’t be willing to do the work in order to accomplish that goal if my only why is to get faster. If your why doesn’t pass the cold, rainy Saturday test, adjust your goal until you find one that will make you want to jump out of bed to make it happen. Coming close to accomplishing your goal can be a scary time. As you near the completion of your goal, stick to your plan. Beware of the tendency to self-sabotage. For example thinking ‘I’ve been doing so well with my weekly track workouts, I deserve to skip this week’. Or ‘I’ve been doing so well with my weight loss, I deserve this cupcake as a special treat’. What about you? Have you made any mistakes that have derailed your running goals?